Located off I-210 Exit 4, Nelson Road. The sights. The sounds. The sensations. With 1,600 of the latest slot machines at your fingertips, you have dozens of potential avenues leading you to your biggest jackpot yet! Pull up a chair, sip a drink and enjoy the latest in slot technology. Grab a cool drink, because you're about to play the hottest games in town. 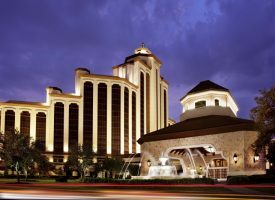 We've got it all�everything from the high-stakes style of blackjack, the fast-paced excitement of craps, to the thrill and strategy of Pai Gow poker. With 83 tables waiting for you, odds are you're in for the time of your life. Rake in winnings 24 hours a day in this exciting 2,100-square-foot poker room, featuring a main room and a luxurious semi-private high-stakes room with special amenities such as tableside food service and chair massages. Games include Limit Hold �Em, No Limit Hold �Em, Limit Omaha High/Low and Pot Limit Omaha. Be sure to present your mychoice card to earn comps and special offers. Our eclectic buffet features American, Tex/Mex, local and Asian-style cuisine, along with an extensive selection of pastries and desserts. The modern American steakhouse features a wide variety of beef cooked to perfection over a wood-fired grill. With the famed Tennessee sippin' whiskey as its inspiration, Jack Daniel's Bar & Grill serves up savory food and tasty entertainment. Set against a contemporary backdrop, the restaurant features delicious Asian-fusion cuisine and authentic Vietnamese selections. Whether it's an omelet for dinner or a burger for breakfast, you can grab a bite at this casual cafe 24 hours a day. Lattes specializes in teas, pastries, sandwiches, and your favorite blends of PJ's, a New Orleans coffee. Indulge in our signature gelato, chocolate candies and other sweet treats. The party's out back at Touloulou's, our deck bar. Come by land or by sea for good food and better times.